As boating season comes to a close, many pontoon owners are taking in their boats for some much needed TLC. Pontoon boats are known for their laidback style. Whether you use your pontoon boat to lounge out on the lake or entertain family and friends all day long, the wear and tear of a pontoon boat is inevitable. At Anchor Marine Repair, we commonly see pontoon boats coming through our doors. Our goal is to rebuild, restore, or repair your pontoon boat so that you can get back to enjoying the ultimate cruiser out on the water. If you are in need of a pontoon boat repair, or even more specifically a pontoon seam repair, look no further than Anchor Marine Repair. Because pontoon boats are your “relax and cruise” the lake kind of boats, they often are decorated with couches, lounge chairs and other comforting amenities that make life on the lake a breeze. While this is a nice luxury out on the lake, the wear and tear of these items can happen. Whether they are out in the sun too long or heavily utilized by passengers, pontoon seams can go array. If caught in a timely manner, you can still save and repair those items without having to replace the entire thing. At Anchor Marine Repair, we specialize in pontoon seam repairs. Whether it is part of the actual boat or a piece of furniture that needs a seam repair, our expert repair technicians can get your pontoon boat looking brand new once again. With over 45 years of combined experience in pontoon seam repairs, our crew knows how to repair seams and make them durable for many boating seasons to come. As we work to restore and improve your pontoon, we want our customers to feel confident in leaving their pontoon repairs up to us. At Anchor Marine Repair, we are your number one repair shop in Minneapolis boat repair. Our passion for boat repair goes unmatched and our dedication to delivering your pontoon back to you in pristine condition is bar-none. We even offer free pick-up and delivery services to your home or dock as long as it is within a 250 mile radius of the Minneapolis/St. Paul, MN area. 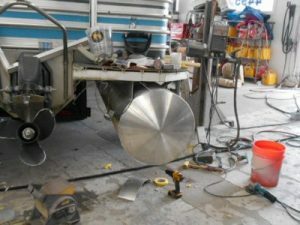 If you are having pontoon seam issues, Anchor Marine Repair should be your first and only stop for all your repair needs. For more information about Anchor Marine Repair and our pontoon repair services, give us a call today at 763-972-3540 or feel free to send us an email at service@anchormarinerepair.com.